​As a human rights and disability rights advocate, Teddy Fitzmaurice loves to talk about civil rights, especially disability rights. Teddy has found that people react strongly when they discover that a person with an intellectual disability, such as himself, voice their concerns about the issues people with disabilities face, and this reaction motivates Teddy’s advocacy and entrepreneurship. Teddy is a person with Down syndrome who strives for independence and a life of value and purpose. He believes that people with significant disabilities can have their own meaningful businesses, and values having a place in the community, a job, and the ability to do regular important advocacy over any money a business can make. In April of 2006, Teddy opened his very own business, Teddy’s Ts and Buttons. Teddy fabricates buttons of his and his mother’s designs and hand-paints t-shirts. All of the designs are intended to empower people with disabilities and show a commitment to civil rights for all. 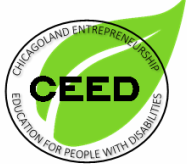 His microenterprise demonstrates how inclusion drives success.